Looking back at the post about the value scale, we can see that value is the level of darkness or lightness of a surface. In a grayscale, the lighter the surface the closer it comes to the value level of white. The other side of that is the darker the surface the closer it comes to the value level of black. Color has value properties as well. A color can be lighter or darker than other colors. Another way to look at this is to see the value of a color separate from the other properties of the color. We can remove the hue of a color to reveal the color's value. In this post we will do just that. We will look at a color sample and then remove the hue characteristics to see how the colors compare in value. Above is a diagram of a sample of colors across the color spectrum that includes the primary, secondary, and some tertiary colors. In the second row the hue has been removed to reveal the value of the color and the value relationships each color has to the others. For an example, notice the relationship between red and blue. The values of the two colors that I chose to use are similar. The hue is what separates them, not the value relationship. This can be useful when developing a composition as it can help harmonize or diversify elements of a composition. If we want to we adjust a composition we can use the hue to divide the composition and the value to connect it. Not only do different colors have different values, we can change the value without changing the hue. This gives the color a different look and provides more flexibility with our composition. A monochromatic image is a good example of this. The hue remains the same throughout the image,creating a sense of harmony,. The value is what changes and creates the variety in the image. Below are two examples of a color's value change blending towards white. Notice the yellow starts at a lighter value than the blue. Because of this, there is less of a transition in value from left to right than there is in the blue example. 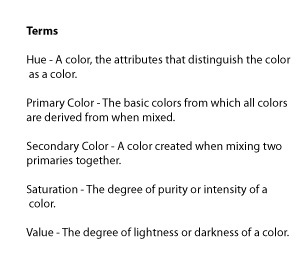 The nuances of the value/hue relationship provide an an important role in a composition. These relationships can be employed to perform several tasks. We can use them to tie together or separate elements of a composition. Also, we can look for the value relationships with in a subject to help a image look three dimensional. If the values don't relate to each other the form of the subject will flatten.